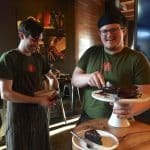 Come and Enjoy the Experience of Seattle's Coffee! Moore Coffee Shop – 1930 2nd Ave The Moore Coffee Shop gives you more than you expect. This stop was definitely one of our favorites. Located between the Moore Theater and the Moore Hotel, this family owned shop offers a unique experience that Seattleites love. 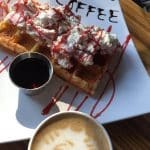 Known not only for their fun latte designs, but unique coffee flavors, and- our favorite part- the waffles! With seventeen different waffle options to choose from, everything from turkey and apple to churro, there is a waffle there for everyone! 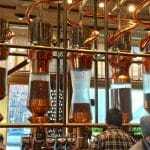 Starbucks Reserve – 1124 Pike Street A must see for the ultimate coffee lover. Unlike every other Starbucks you’ve been to, the Starbucks Reserve here on Capitol Hill is the only one in the world. Here you truly get to watch the art combine with the science of coffee brewing. Starbucks president, Howard Schultz, says they wanted to build something that had not been created before, to create “the Willy Wonka of coffee.” This experience connects the working roast to a café all for the customer. There are multiple bars to sit at and enjoy all the different varieties of coffee the reserve has to offer, brewed up right in front of you. 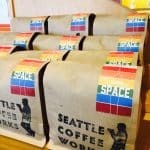 Seattle Coffee Works – 107 Pike Street Now on its tenth year of operation Seattle Coffee works has already opened up a second location. It began as a multi-roster in 2006 where people could come in and order some of the best espresso from roasters all over the city. Today they are one of the only places that roast their coffee right in downtown Seattle. The barista was proud to inform me that they roast three times a week right next door. What we loved most about this business was their business ethics. Around 80% of their coffee is sourced through direct trade. Meaning, they are working directly with the coffee farmer to make sure, not only are the customers getting the best product, but the hard working farmers are getting the maximum possible benefit.